A shortcode for the button in the Brooks WordPress theme implements both roles: action on click and fit into your WordPress site’s style. For these purposes are used options in shortcode popup named “Theme Button Settings”. Next is going description of options helping customize button. It’s been for button’s style color filling you can opt from two favorable variances. To adjust style color filling of a button find an option shown below and click one. The choice is yours, it’s entirely up to you. Also one of the features is a size adjustment of the button: you may enlarge a bit button if set a size dropdown value to a “large”. In the sake of common position of the button regarding its container has been made an option for alignment. Choose from three common variances and set value of dropdown. Notice the “left” option pull the button to the left side of the container are chosen by default. Brooks theme supports an ability to insert an icon into text line of the button. To activate this future check the box titled “Add icon” after that it would be possible to adjust the icon. An “Icon Alignment” field (look below) carry out a function of how the icon to add either prepend or append. Next, choose the icon library and specific icon from it. All libraries are included to theme source, so you are able to see every single icon given from chosen library. At last but not least an ability to add animation selecting a type of animation for the button, that appears when it “enters” the browsers viewport (Note: works only in modern browsers). By default, the button has not animation. As action on a click you may consider from two option: first is to enable modal window, second – define a custom link. Let’s go through the modal window. 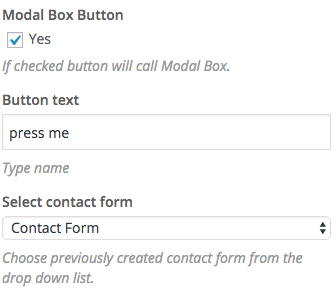 To activate this future check the box titled “Modal Box Button” after that it would be possible to adjust a text in the button (writing it in the field “Button text”) and a body for the modal window. Before, that you should have been created the form in the “Contact Form” lain in the Admin Panel which you are going to use as the body for the modal window. if the contact form exists it would appear in the dropdown field titled “Select contact form”, just select it. Also, you are able to set a link for the button. For this be ensured that field “Modal Box Button” is unchecked , and simply click “Select URL”, than in popup define URL and title( here title is a text in the button).